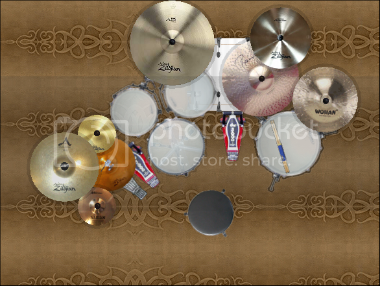 I really want a decent somewhat intermediate/advanced drum set, in the 6 or 7 piece area... and sadly i dont have a whole lot of money to invest in it for now. i was thinking maybe a pdp x7 series, but ive also found some good deals on pearl 5 piece full drum sets, which i figure i could build on and work with later, where i would buy an extra rack tom and the a second floor tom. but again, im having a lot of trouble deciding. i play primarily heavy metal and harder stuff, but i do enjoy the versatility of using a somewhat lighter tone... id apreciate any help at all, and reccomendations for any others sets would be great too. Buy which ever brand has the hardware you prefer because every major brand is going to be comparable for quality in the beginner, intermediate, and semi-pro levels. Tone is going to come from your head selection, tuning choices, and how you physically strike your instruments. If you're buying a new Pearl you'll get your add-ons from either the dealer or from classified ads and/or eBay. If you're buying a kit that's more than a few years old you won't be able to get add-ons from the dealer, only classifieds and/or eBay. pdp make some great kits, now granted the older x7s did not sound tht good compared to the others, but ive heard they have been redesigned using a different kind of wood or something so im sure they sound great. my fs sounds amazing for the money. as far as hardware goes pdps stuff is pretty durable, the only problem i have had is my hi hat pedal doesnt like to stay tightened but it did fall out of a speeding truck (pick drivers wisely). Mapex? They're quite cheap for the money and they make a great quality drums. 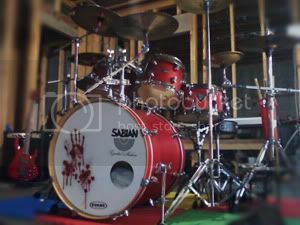 Check out D-Drums as well they have some lower priced kits that sound great. Asdex wrote: Mapex? They're quite cheap for the money and they make a great quality drums. Yeap, gotta say I love pro m's. My drum teacher uses it and I totally regrets getting my superstar after trying it. It'll be quite hard to find pro m now cause they discontinued it and change them to meridian maple. There's a huge discount in musicianfriend on pro m, go check them out! prowler029 wrote: pdp make some great kits, now granted the older x7s did not sound tht good compared to the others, but ive heard they have been redesigned using a different kind of wood or something so im sure they sound great. my fs sounds amazing for the money. as far as hardware goes pdps stuff is pretty durable, the only problem i have had is my hi hat pedal doesnt like to stay tightened but it did fall out of a speeding truck (pick drivers wisely). Vote for the Mapex. I ended up with one after I owned my Sonors(I still have both kits). The Mapex is awesome. Vision series drums, by Pearl. Next Level Perfection. Built for the drummer who can tell the difference.